In my early childhood I participated in a quiz show and won the first prize by answering questions on Greek mythology. That event opened many doors for me, and I began to work in television. By the time I was 20 I had travelled all over the world and interviewed personalities such as the Pope, President Carter, Jane Fonda, and Woody Allen. Still, I found that my life was rather empty. I was sad. I had everything, but something was missing. That something was spirituality. Starvation and social injustice in Latin America and Africa overwhelmed me. I was not an active person and I was just letting life pass me by. When I reached the deepest point of depression I thought I would rather die. But I decided to live. I had a wonderful wife and two sons who gave me the motivation to live. I decided to get involved in life and show people things that were helpful so that they could become better persons. You have to be a good person, for good thoughts bring good things and bad thoughts bring bad things. Things (in this day and age) are happening very fast, and while there are terrible things happening, there are also wonderful things happening. This is not just the end of a century but the end of a millennium. Today we are able to speak freely of things which just a few years ago we would not have dared to say in public. Swami says, “If you don't believe in God, believe in yourself.” Your life has a reason so don't waste it. Twenty five years old, I decided to seek spiritual phenomenon. The good thing about Swami is that when you look to Him, He comes and shows you the path. When analysed, all religious books speak of the same path and the same truth – be a good person and do good. I read many books and found this. On television I first showed a controversial documentary on healing. I wanted to shake people out of their shell and awaken a few to start thinking about the more wonderful and mysterious things that are part of this world. Of course there would be a few critics, but then the good goes with the bad. At 17, when I first visited India, somebody gave me a book on Sai Baba as the spiritual teacher. The spirituality I felt in India I have never felt anywhere in the world. But it took me 17 years to go back to India and visit Sai Baba. The first thought I had when I saw the picture on the book was, why is He so ugly? Then I said to myself that He must be a very good and wonderful person because millions believe in His message. When I read His book, the first message that stuck in my mind was, there is only one religion, the religion of love. He says that whether you are a Catholic, a Moslem or anything else, be the best man, person and human being in that religion. The night I read that passage I was so moved that I prayed for Him, saying, “God Bless you.” At the same time I asked Jesus for forgiveness because I believed Baba's message and wanted to meet Him. I remember reading that Swami said, “When the time is perfect and you desire it, you will come and visit Me.” After a while I forgot about Him until I met Leonardo, the coordinator of Sai Centres in Spanish-speaking countries. When I asked Leo if I could interview Sai Baba, he said that Swami had rejected "60 Minutes", so why would He give me permission to film Him? I replied that we were a highly underdeveloped country and we needed help and guidance. Leo explained to me that no private network had been allowed to film Baba without restrictions. Anyway, he said that he would make inquires. Three days later, he called and asked me if I would like to go to Prashanti and said that I was allowed to film in Prashanti. They had allowed Argentina and Japan to film, Swami. So we went to India. Everyday was a miracle. I needed to test Him and He provided me with many more opportunities than I had even requested of Him in my mind. I can only be grateful to Him. The moment you step into His city it is different-the air, the atmosphere, the smell, the singing of the birds. The people in the city look into your eyes. I thought, This is definitely a City of Love. The simplicity of the temple contrasts with the overpowering wealth of the Vatican. I love the simplicity. At my first darshan, just seeing Him float majestically through the people, and the love the people had in their eyes, was magical. I thought that if a human being could bring about such feelings in thousands, millions, of people present here and around the world, then He must be a holy person. The moment I set my eyes on Him, I started to cry. I could not understand my feelings because I did not love Him so much. I thought that it must be the aura and the energy. I closed my eyes and thought, if it is true that you read people's minds, please come to me and say something nice to me so that I can believe in you. I opened my eyes and said to myself I was being stupid-out of so many people who love Him, who believe in Him, why should He come to me. When He came very near, I closed my eyes and said, now or never, say something to me. I opened my eyes and saw Him come directly towards me but without looking at me. He talked to the Argentinean sitting next to me and totally ignored me. Then he spoke with the person on my other side and I thought, Good. Now He will talk to me for it is my turn. Bit He just turned and started to walk away. I thought to myself, this is a lesson for me in humility, and I said, God bless you for you are certainly something for these people. Just as I finished thinking this, He turned abruptly and looking at me said, “Those are nice thoughts.” I looked at Him and He came towards me and laughed and said, “Of course you are going to learn things here. Open your heart, open your heart.” I was dazed and wondered if I had imagined it all. To make a long story short, every day I had a test for Him and He gave me how I could do this. Could I not believe in the energy of a holy being just by being there? But I had to do it; it is my nature. not film the verandah where the VIPs and the people who have been with Him all these years sit. The reason given was that their ego and vanity would be fanned. We spoke with Dr. Goldstein, Phyllis Krystal, artists and people from different countries. One day, Baba made us stop. I asked, “Have we done something wrong?” and Baba answered, “Eat something, keep your energy up!” and He gave us bread. Other times He gave us prasad (blessed food) and wonderful gifts. His presence and love were magical. The messages I was receiving from Him in my mind were so real. For example, Be the master of your life, open your heart and close your mind and personality and let life flow trough you. My sister-in-law had given me a letter for Baba, but my ego did not permit me to be in the darshan line with a letter. I was thinking, if He knows everything, why does He need a letter? Nevertheless, I decided to bring the letter so as not to deprive her of the opportunity of being blessed. And just in case it was good to write to Him, I quickly added to the letter. Well, when Baba came close to where I was, I quickly hid the letter behind my back, ashamed to have it with me. But Baba stood quietly and then said, “Give it to me”, and I had no choice but to hand it to Him. Of the three weeks that I spent there, the first week was heavenly for He granted me whatever I wished for. The second week was hell because I fell very sick and thought I was dying. But the last day, when we were to take our leave of Him, was paradise. When I fell sick, I started discovering things about myself - who I was and why I was here. I was alone in the room and delirious with fever when I saw Swami come into the room. He looked at me very deeply and calmly, and went away. That night I dreamt of Him. He was outside the temple and He was beckoning me to come to Him. I ran to Him and asked Him if I could hold and hug and kiss Him. He said, “Yes.” Then I asked Him a very personal question, and He gave a precise answer. When I woke up it took me a while to realise that it was a dream, for it was so real. journalist for my country, and to ask Him if He was really God. I was silly and vain. We had just two days left before we were to leave and we still did not have our interview. So when I was sitting in the darshan line, I closed my eyes and said, Please, please, can't-you understand I really need an interview. When I opened my eyes, He was there and very seriously He said, “You will have to be patient.” He gives a lesson at every step. I thought to myself, what difference will it make, having an interview? Will I become a better person or will I just become more egoistic? 1 love him so much already and it is just my ego to show off to people that I want an interview. All these thoughts made me cry, for I realize my shortcomings. So in my mind I said to Him, Don't let me film the interview but just let me be with you and touch you like in my dream. Even if you don’t give me the interview, I love You so much and I am very grateful to You and I will always remember You. But still, if you can, please give me an interview. Just after this thought a boy came running to me and said “Swami says that what you just thought is wonderful.” After a while, Dr. Goldstein came and said, “Come on, the interview with Baba is now!” I was deeply moved. I came for His birthday in a very unexpected way. 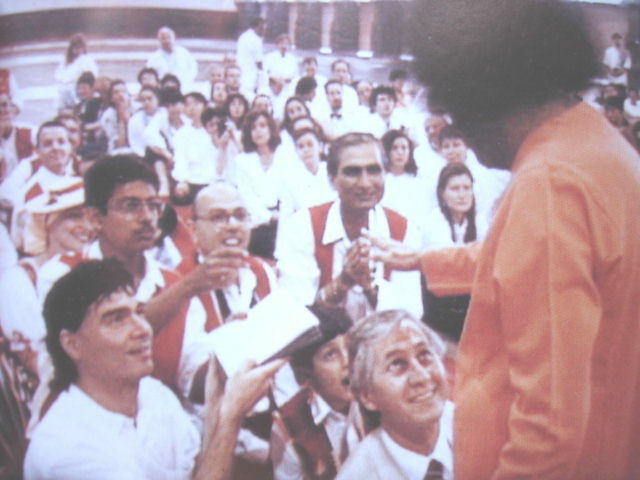 When I returned to Argentina I was very sad because I missed being with Swami. A week before Swami's birthday, I was cordially invited to go to Puttaparthi to attend the Birthday celebrations if I wanted to. During this visit, I had a dream that I was dialing Mother Teresa's number and that she herself answered the call. She also said that she was waiting for me. I woke up feeling sad that this was just a dream but I went to the phone and called the number at 6:30 A.M. and surprise of surprises Mother Teresa herself answered and gave me an appointment! 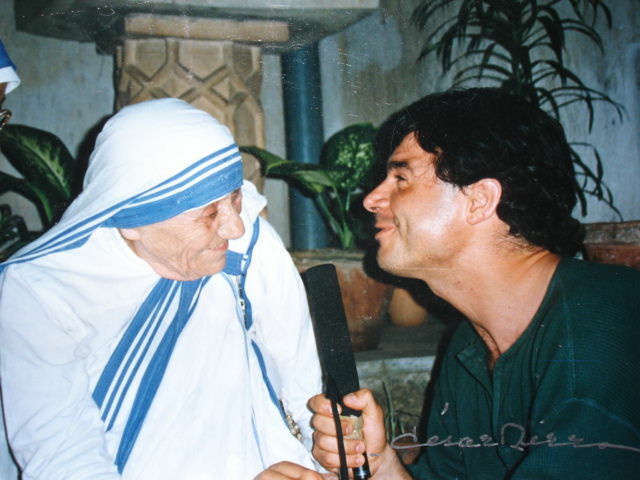 So He enabled me to interview Mother Teresa, whom I had been trying to interview for the past several years. I was able to live with her, interview her and film her charitable acts for a week. (During this visit), I was also allowed to sit in the Verandah. When Swami came for darshan He looked at me in a funny way and I closed my eyes and said, Please tell me if what happened in my last visit was an illusion or reality. When I spend my eyes, He was standing in front of me. He assured me by nodding, and then he walked away. In my country, 80 percent of the people now know who Sai Baba is. Many of them really like and even love Him. We have a show called A Better World in which we share Swami's message. I have also showed footage comparing the exact words of Jesus and Swami, to show how they are alike and how their message is the same. The reactions have been wonderful-exactly the way He had predicted them. For every negative reaction, I have had a thousand positive ones.